All together now: "Its cold outside, there's no kind of atmosphere...." Well this was a pleasant surprise, I had not heard about this intill today even though it has been on the cards for over a year now. I'm not sure about you guys but I know I am looking forward to see if it is good. 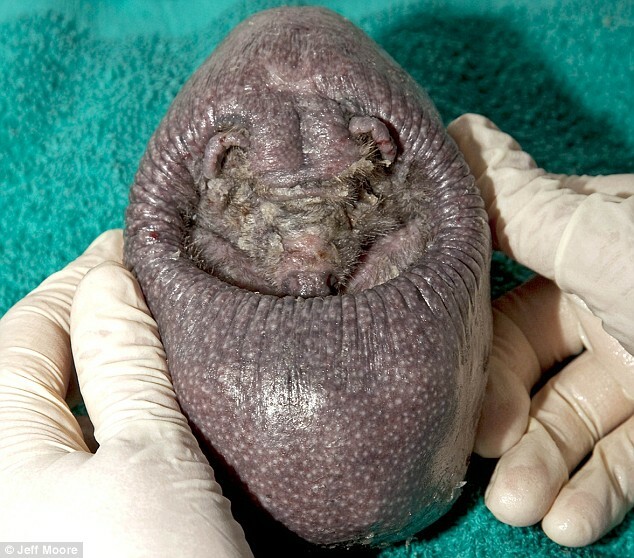 Spud looks a sorry sight! He is a spineless wild British hedgehog currently in the care of Tiddywinkles hedgehog sanctuary in Buckinghamshire, he has been with them since August 2008. 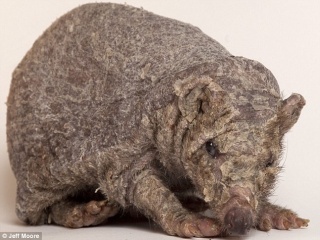 Every day he has a bath and baby oil massage, he has very dry skin and on his back there is no hair or spines at all. I love how you can see the muscles used for rolling up! They don’t know why he doesn’t have any spines or why they do not grow back but it is possible to grow them, one or two have appeared under the skin but were in growing and had to be removed. He lives a healthy life and is now infamous, but I hope he grows his spines back, a hedgehog is nothing without his spikes! Warning, this is a distressing blog post and very information heavy. The following youtube video shows the highly reported and alarming story of Hope Steffey from Salem Ohio USA who sued Stark County Sheriff department and 6 of their deputy's in early 2008 for assault and harassment. 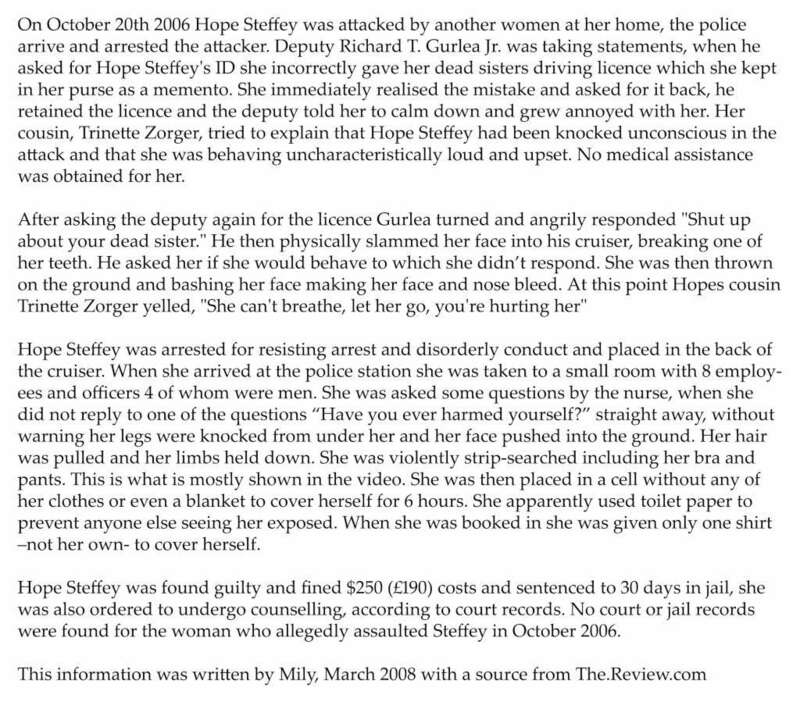 The video does not show the events leading up to it when Hope Steffey called the police for help after an assault at her home and was then arrested herself but does show the worrying scenes in which Hope Steffey was admitted to the cell and strip searched against her will. According to The-Review.com Hope Steffey was not asked to remove her clothes, nor explained why a strip search was needed. She asked them why several times while being forced as shown in the video. There were several male officers present against county policy as well as the video camera. As the tape progresses you can see how Hope gets more and more distressed by the ordeal. Not only was she treated appallingly on several counts, abused and humiliated but there are several accounts that she would not have behaved in such a way without the head injury's and trauma from the initial attack, which left her unconscious with patches of hair missing. Regardless of her innocence police abuse cases like this should not happen. Full stop. I was keen to read up on this story no matter how distressing it is, because her ordeal and others like it is my worst nightmare. The idea of being a) physically held down against my will and b) locked in a cell would be pure hell for me. It seems clear to me that this event was handled very oddly. Why would 8 or more members of staff be ready with gloves and the video camera? Why do half the night shift turn out to watch? And why was she left waiting alone in the cruiser for 5 minutes while the deputy talked privately? And afterwards why hide tapes and evidence from prosecutors and press? And why not give her clothes back after the search? What worries me the most is that this is one of only who knows how many abuse cases. After doing a bit of research I found 5 other women have so far complained of similar treatment in this county. The bill of rights says you need a warrant to have your home or property searched but basically the police can FORCE a strip search on civilians at any time or place. Even in a public place in view of bystanders or your neighbours, let alone at the station with a disorderly conduct charge. Compared to the story from Alcart police station where as a result there was 1 firing, 1 resignation and 4 suspensions, in June 2008 it was found by Grand Jury that the Stark County officers did nothing wrong. The event was as a result of precautions against suicide and self harm, and apparently in Hope Steffey's best interests. This was also said of "Elizabeth" another women who was strip searched at Stark County Jail. In November 2008 the sheriff finally spoke to press. I really hope the outrage and negative reaction's of the public to reports in the media as well as blogs and forums on this case and others like it shine some light on the system, I believe it needs a serious re-work to protect people in the custody of American police, the Sheriff and his deputies. I can only say out of the several times I have been involved in violent crime here in the UK the police officers and their teams have been nothing but supportive, helpful and accommodating. I can only prey that incidents such as this are isolated, dealt with fairly and those responsible are punished accordingly. By the left...apply red noses! 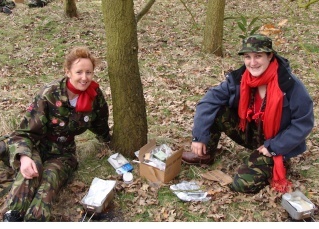 On Saturday 7th March 17 ladies took part in "I'm an Army wife, get me out of here!" 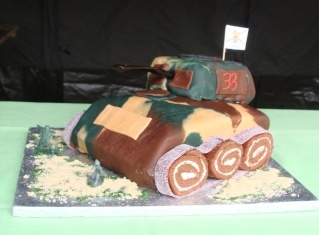 event at Carver Barracks in Wimbish organised by 33 Bombshells - the wives committee- to raise money for Comic Relief. For one day the trophy wives got to wear the trousers (and the boots), and spent a day of endurance in the life of a solider. We started with Drill on the parade square (very entertaining) for an hour followed by a ration pack lunch in a spiny on the airfield. It wasn't too bad but I wouldn't want to eat it again lol. We all did well but special mention to the girls who put coffee in the mess tin while still in the packet ; ). After the ladies "did lunch" we went skid pan driving in a land rover which including a timed course and doing power slides like Miami vice! Then there was clay pigeon shooting followed by rock climbing and abseiling. This was the hardest, none of us expected it to be such hard work, only 4 got to the top, well done Janel and Charlie : ) Last but not least finishing the day in true squadie style there were of course drinks and beer. 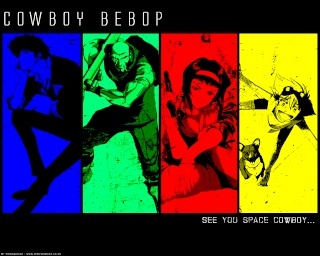 Cowboy bebop is my favourite anime bar none. It has a seamless link of sci fi and realistic action (and fist fights) with anime and music, it is easy going, funny and cool. 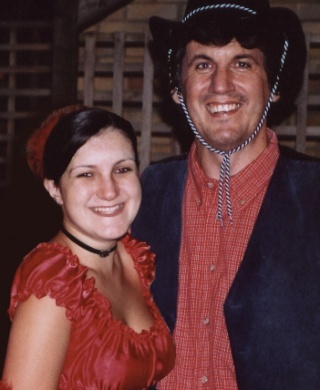 The characters are space cowboys who have a lot of our present day life in their story from their costumes to what they eat, which really makes you feel connected. 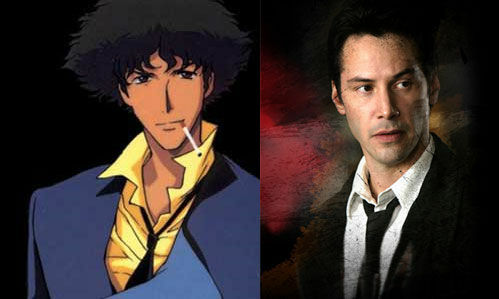 This funky anime has impressed many including Keaneu Reeves who is really pushing it for production, they have a script but no one has come forward yet to take the rights for a movie. I think as an American actor in a very westernised anime he would make a good Spike Spegel and I look forward to some more information on it, Watch this space. 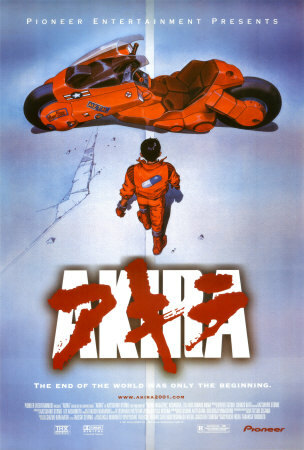 Japanese anime classic Akira has a live-action remake. There will be two movies and both will be based on the 6 Manga graphic novels rather than the 1988 anime movie we all know and love. The first of which is due to be realised summer 2009, although there is no date and no trailer as of yet which is a bit worrying. It is being made by Warner Brothers and directed by Leonardo DiCaprio who also plays Keneda, a 34-year-old white man to play a Japanese teen? It is odd that a Japanese story will be played with American actors and I’m not sure without “americanising” it and there for ruining the atmosphere they can pull it of, but then it was always much more popular in the west than in Japan. Casting aside the cyberpunk story should translate well into live action; loads of action scenes, motorbike chases, government coups and sci-fi powers, all set in a post-apocalyptic city I can’t wait! 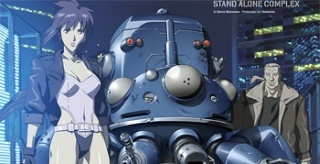 Ghost in a shell made in 1995 is one of the biggest anime movies of all time, it asks a lot of questions about future technology (it heavily inspired The Matrix) and I love it. It has 2 sequels, a series, several books and 3 computer games, all based on the Manga by Masamune Shirow in 1989. Dreamworks have the rights and Steven Spielberg is directing it, and an ex Marvel boss is producing. They have a script but no information on casting or a release date yet, and all the news I could find was nearly a year old. Even though it looks to be American made I’m sure the high-class production team and the 3D effects will be spectacular. I hope they don’t tone down the story line, and it’s a shame they cant use other content rather than remake the 1995 movie but I have faith in Spielberg (he is a fan of the movie himself) and I trust him with my 2nd favourite Anime Movie. There is a big anime/Japanese culture among our generation here in the UK and after the last 5 or 6 years worth of live action comic book and 80’s cartoon blockbuster movies (transformers was awesome) it is only natural progression that they move onto anime and Manga adaptations. All together this would a be a long post so I will spilt it into 3 and try to embed trailers where possible. Blood: the last vampire is about a 16 year old girl who is really a 400 year old vampire. Set in post WWII Japan it has lots of action and samurai demon slaying, it looks good. This movie is being released on June 12th 2009 but only in the UK, no USA cinema release that just shows how large the Japanese culture is over here. Afternoon tea is making a comeback. Customers are flocking to tearooms and eschewing the ghastly coffee chains with their thick, foaming, sickly, jumbo-sized hugely expensive coffees. 0s, we were forever asking people to tea. It saved you the bother of cooking a proper meal, and only lasted an hour or so. The career power women of the eighty's with their sharp hair cuts and strong shoulder pads have raised a generation of daughters who are more interested in enjoying the simpler things in life, like baking and tea cups. It is much more satisfying to take the time to have your tea brewed in a pot or strained over leaves, in a special cup with some sweet treat. It seems so English and so peaceful, which is really what we could all do with a little more of. I'm sure if any of you know me you will know I am fond of computer games. 2 years ago I played a game that knocked my socks of. 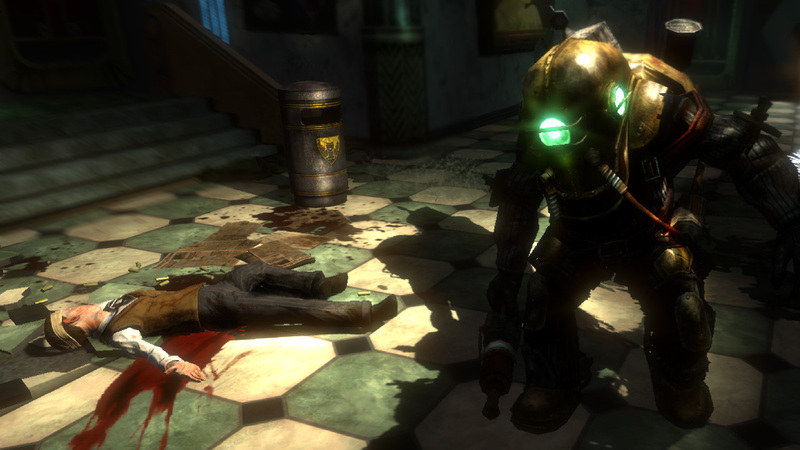 Bioshock. It is essentially a first person shooter / RPG, but is a whole lot more! You get so sucked in by the atmospherics, the music, the story, the style, it is a creepy mysterious beautifully made game. It manages to be sci fi and scientific whilst staying retro. 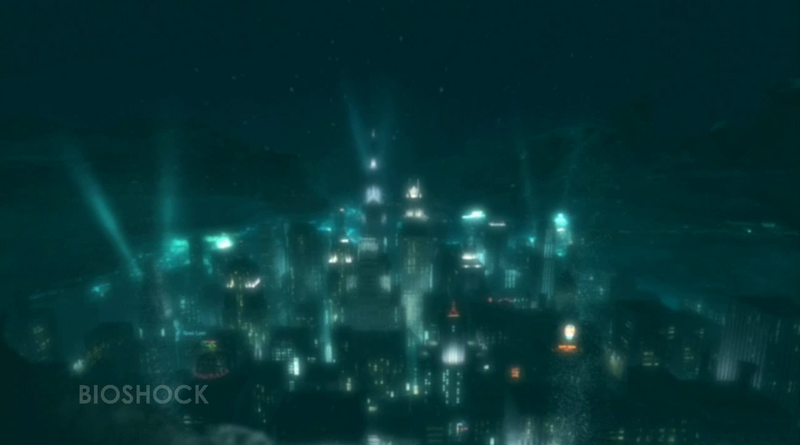 In 1960 a man who crashes from a plane and into the North Atlantic Ocean, finds a light house with a submersible inside. What does he do? He goes down of course. 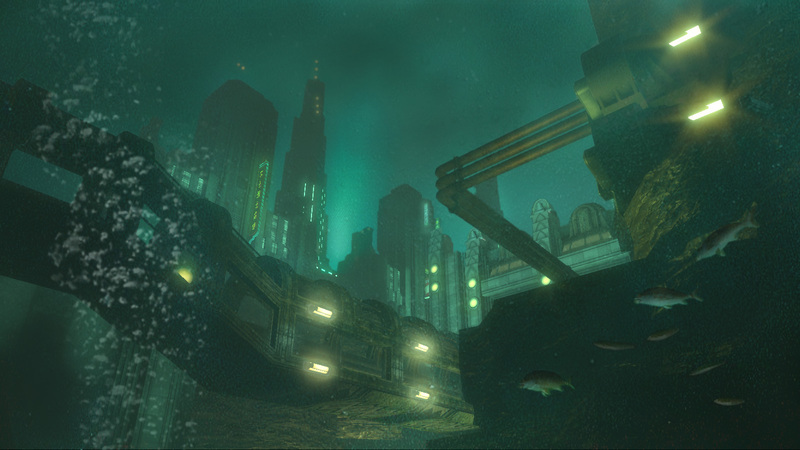 The city of Rapture is an underwater haven built in the 1940s for those who do not wish to be tied down by laws, morals or beliefs . 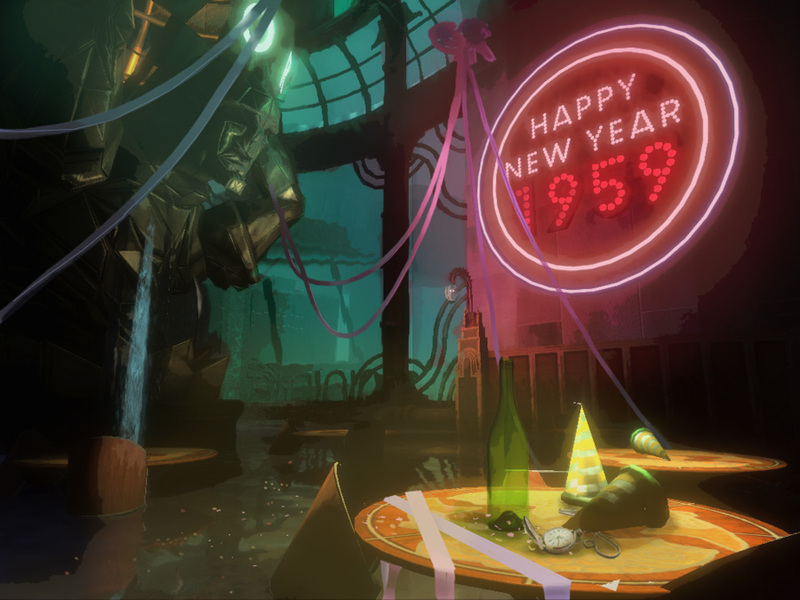 . . but it all went to pot and 25 years later un checked genetic experiments, gangster law and riots (mostly against Ryans death penalty which led to pheromone control) have turned rapture to a shell of what it once was. 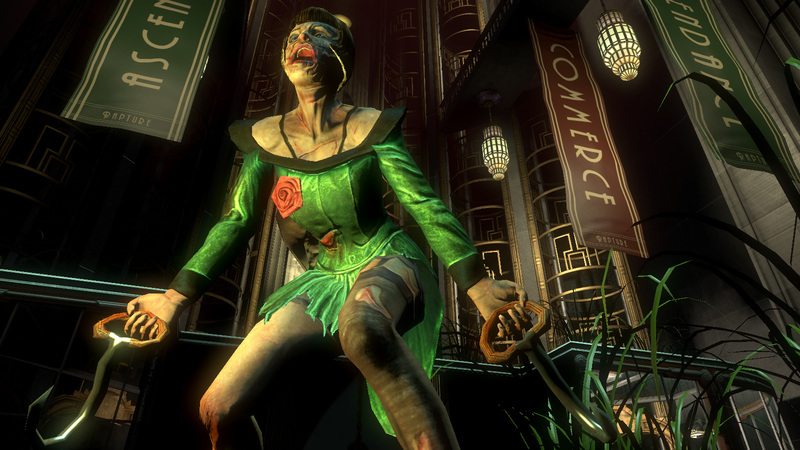 The player arrives to the abandoned city with junkie splicers working as gangsters in the deserted What ensues is a dramatic first person shooter, with super powers you can pick and choose - from the consumers point of view. It has weapons upgrades, parallel story lines, security cameras, gun turrets, genetic modification and creepy little girls with their giant body guards make the game play fantastic, and the whole package is pure brilliance. It won no less than 8 game of the year awards and many more art visual and sound realated awards besides. I suggest you go and at least try the free download demo (if it is still available) or pick up a second hand copy of the game if you see it, it will be well worth your while! Recently I have gotten into some new music and I love some of Kenny Chesney as well as Trace Adkins and Alan Jackson. That kind of feel good country music makes me imagine I'm driving on a straight road through the southern desert in a pick up truck wearing a straw cowboy hat with the windows down, good times! Well maybe not in that outfit, the feathers for one would be a mess! The for mentioned straw hat and blue denim dungarees would be more suited I think : ) That photo was for my 18th Birthday way back when, pictured with my Daddy out side the hall. I really love those feel good country tunes but as with lots of music, I like a few songs or artists but haven't the foggiest where to find more new music. I'm too broke to buy new CDs out with out knowing first if ill like it or not, any ideas?